From the centre of Dolgellau, at the top of the main square, branch left. Carry on this road until you come to Penbryn Garage. Opposite, branch left up Cader Road toward Cader Idris. Carry on this road for approx. 3 miles. Tyddyn Mawr is the first farm entrance on the left after Gwernan Lake. Click on the maps for further directions. Machynlleth, Tywyn, Fairbourne (the nearest) and Barmouth stations have direct trains from London and the West Midlands. See The Cambrian Lines web site for details, and for Dyfi Valley public transport see the timetables here. Buses travel to Dolgellau, from where a taxi would be necessary. We are remote! "Everything so right - spot on! Thank you for making our stay so warm." - Mr & Mrs Thomas, Surrey. "Absolutely fabulous! Another brilliant stay. Great hospitality as usual." - Mr & Mrs Turner, Stoke-on-Trent. "Peaceful and magnificent. Thank you very much." - Frances Leger, France. 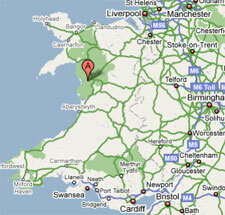 We nestle on the northern flank of Cader Idris in Southern Snowdonia, Wales, in the United Kingdon. Please click on the map for directions from anywhere in the UK!